CCC Polkowice's fans have finally celebrated EuroLeague Women joy after their team outscored Beretta-Famila (68-65). In the other ELW games from Group B Fenerbahçe SK beat UNIQA-Euroleasing Sopron (91-60). Perfumerias Avenida completed a perfect evening for the hosting team in Group B by beating Tarbes (78-70). However the Spanish champions did not have it all their way and went into the locking trailing (25-28). Treys by Paoline Salagnac and Pauline Krawczyk from Tarbes in the first minute of the third quarter (34-25) finally sparked the hosts into action. Dewanna Bonner ignited the hurricane Perfumerias Avenida with a three-ball. 180 seconds later and 15 unanswered points the ELW champions were back in front (40-34). 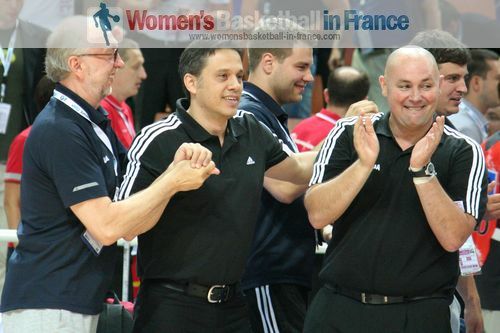 Tarbes struggled for the rest of the quarter and went into the final quarter with a 12-point handicap (45-58). The champions were unable to maintain the same force during the final quarter but kept a double-digit lead until the 37th minute. Tarbes started to hit their long shots. With also Ana Cata-Chitiga (in picture) picking up everything under the basket they gave the hosts a little scare as they reduced their deficit. However the Spanish side had enough gas in the tank to step up and win comfortably (78-70). Bonner had another big game with 24 points, 6 rebounds and 4 steals. Erika De Souza in her first game back after national duty with Brazil at the Pan American games added 15 points and picked up 10 rebounds. Team captain Isabel Sanchez chipped in 15 points. Cata-Chitiga led Tarbes with 16 points and 7 rebounds while Salagnac added 13 point as well as dishing out 6 assists. Krawczyk was the other player in double digits with 11 points. Tarbes are now bottom of Group B and are still waiting for a victory this season. Sharnee Zoll had one of those days when everything went her way. She dished out 10 assists, came away with 3 steals and 21 points. She went 3-from-4 from beyond the arc. However what turned the game in favour of her team CCC Polkowice was her drive and determination which enabled her side to open up a 10-point advantage during the third quarter (51-41). Beretta-Famila are not a team that give in easily and came storming back without regaining the lead to set up a nail biting finish that went down to the very last shot. CCC Polkowice escaped with their first victory in EuroLeague Women (68-65) with Zoll as the hero of the day. 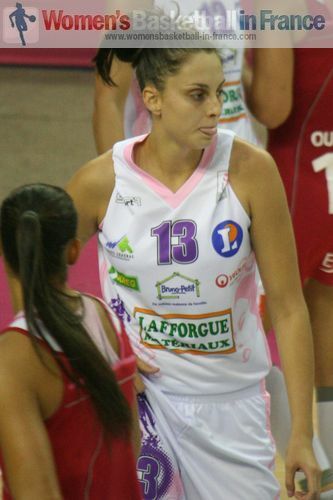 Her team-mate Iva Perovanovic added 15 points. Laura Macchi led the Italians with 15 points. George Dikeoulakos, the head coach of Fenerbahçe SK, has experienced the highs and lows of leading this club in seven days: two victories in the EuroLeague and a defeat in domestic action. His team team took control of the game against UNIQA-Euroleasing Sopron for good with a 20-0 blitz in the first quarter on their way to a (30-12) lead. The guests from Hungary were not intimated by the crowd and had the better of the second quarter and went into the locker room with just 9 points in arrears. Fenerbahçe SK finally woke up in the third quarter after a little bit of magic by Angel McCoughtry and the driving force of Penny Taylor. The home side had control once again and went into the final quarter leading (68-42) to finish the game with a very comfortable margin (91-60) with every single player scoring.